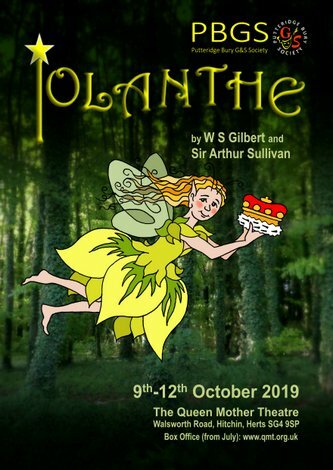 PBGS: Our next production - a Triple Bill! Thank you to all our audiences who made our week presenting Jack the Ripper at the Queen Mother Theatre in Hitchin such a special one! We appreciate all the support (especially from those swaying along at the back during the finale!) and hope you will all be along to see us at our next production in May 2013, when we will be presenting a triple bill of one act operas. 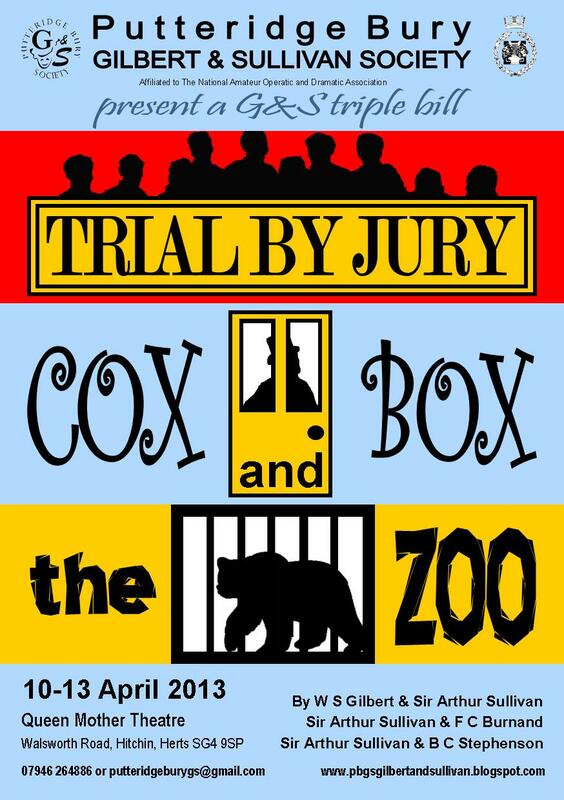 We have a bit of Gilbert partnering Sullivan in the ever popular Trial by Jury, and even more of Sullivan partnering firstly Burnand and then Stephenson in Cox and Box and The Zoo. 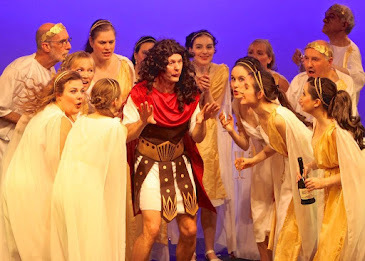 Both of these operettas are terrific fun and we guarantee that you will have a wonderful evening. 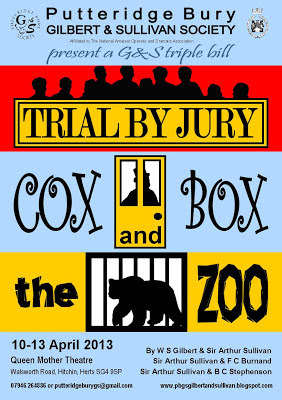 Trial by Jury is a comic one act operetta by Gilbert and Sullivan which was first produced in 1875, shortly before The Zoo which we are also presenting in this Triple Bill. Although this was Gilbert and Sullivan's second collaboration (the first being Thespis), all the essentials we expect of a classic G&S farce are here - a parody of 'breach of promise of marriage', a Judge who has risen through the ranks by dubious means, an unfeeling Defendant and a fainting Bride. With music that sizzles along, Trial by Jury was a huge hit when it opened, where it ran for 131 performances at the Royalty Theatre. 138 years later it's still a much performed favourite. Cox and Box, by Sullivan and Burnand, is our second one act comic opera and tells the increasingly surprising story of two men - one who works days and one who works nights - who are unwittingly renting the same room. Cox and Box was written 5 years before Sullivan’s first partnership with Gilbert for Thespis and premiered in 1866, becoming so popular it ran for 264 performances. Sullivan shows all the musical flare we expect from his later partnership with Gilbert, and Burnand delivers a wonderfully ridiculous story that never flags and delivers plenty of laughs. The Zoo, by Sullivan and Stephenson, is a one act comic opera without dialogue set in London Zoo. Premièring in 1875 at the Haymarket Theatre, it had a five week run and two short revivals before vanishing from sight. Luckily for us and comic opera lovers everywhere, this gem of a piece was rediscovered by Dr Terence Reece, who bought the manuscript at an auction and arranged for it to be published. Its modern premiere was given by the Fulham Light Opera in 1971 and a recording by D'Oyly Carte Opera Company in 1978 ensured that this wonderfully funny work re-entered the canon. It has remained popular ever since. The Zoo is a farcical tale of two lovers - a nobleman who is wooing a seller of cakes and buns, and a young chemist who mistakenly believes he has accidentally poisoned his beloved. All kinds of confusion reign until finally all is resolved and the couples live happily ever after. We look forward to seeing you all again in May!